Background: Streblus asper, family Moraceae is well-known important medicinal plant used in the Indian system of medicine. In Ayurveda, stem bark of S. asper is recommended against elephantiasis for which there is still no any other effective medicine in the modern system of medicine. Objectives: In the present work, methanol extract (SAM) and its fractions of S. asper leave tested for in vitro anticancer activity against cancer cell lines (MCF-7, A-549, Hep-G2, and K-562) which claims its folklore importance in cancer and gas chromatography-mass spectrometry identification of extracts was also performed. Materials and Methods: Shade dried plant material was extracted with methanol and fractionated sequentially with hexane, chloroform, and butanol. 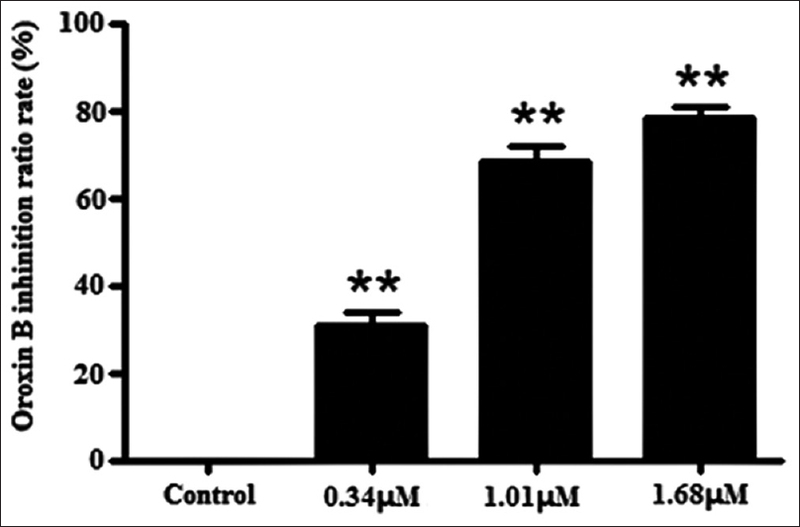 Results: All tested extracts found highly effective against human lung cancer cell line (A-549) with IC50 <10 μg/mL. On Hep-G2 cancer cell line, only chloroform fraction are highly active with IC50 <10 μg/mL. Methanol and hexane fraction showed potent anticancer activity on K-562 cancer cell line with IC50 <10 μg/mL. Conclusion: Qualitative phytochemical analysis confirmed the presence of fatty acids, phytosterol, triterpenoids, polyol, sugar acid, aldehyde, diterpene, terpene, carboxylic compounds, acid and sugar in S. asper leaves extract. Topmost abundant compounds in SAM are α-D-glucopyranoside (10.60%), glycerol (7.96%), myo-inositol (4.90%), and butanedioic acid (3.30%). Hexane consists of the higher amount of hexadecanoic acid (18.07%), octadecanoic acid (7.39%), β-sitosterol (4.50%), and α-D-glucopyranoside (4.03%). Higher component in chloroform extract is lupenyl acetate (11.25%). Abbreviations used: SRB: Sulforhodamine B assay; SAM: Methanol extract; SAH: Hexane extract; SAC: Chloroform extract. Background: Tumor necrosis factor-related apoptosis-inducing ligand (TRAIL) is a cytokine that activates apoptosis through death receptors on the cell surface and is regarded as a potential anticancer agent. However, many cancer cells are resistant to TRAIL-induced apoptosis. Objective: The aim is to identify the herbal medicines that could help overcome resistance in TRAIL-resistant lung cancer cells. Materials and Methods; TRAIL-resistant A549 cells and 13 herbal medicines with known apoptosis-related anticancer effects were used in this study: Clematidis Radix, Corydalis Tuber Rhizoma, Paeoniae Radix Rubra, Corni Fructus, Curcumae longae Rhizoma (CLR), Moutan Cortex, Salviae miltiorrhizae Radix, Phellodendri Cortex, Farfarae Flos, Paeoniae Radix Alba, Angelicae gigantis Radix, Coptidis Rhizoma (CR), and Taraxaci Herba. Cytotoxic effects were investigated after a 48-h incubation, using an 3-(4,5-dimethylthiazol-2-yl)-2,5-diphenyl tetrazolium bromide assay, to identify the herbal medicines with the most potent synergistic effects with TRAIL. Results: The majority of the 13 medicines exhibited concentration-dependent cytotoxicity against A549 cells. Among them, CR and CLR showed the most potent cytotoxic effects, based on the IC50. We then investigated the use of these two medicines in combination with TRAIL and identified synergistic cytotoxic effects against TRAIL-resistant A549 cells. Conclusion: Synergistic cytotoxic effects of the combination of TRAIL and herbal medicines, in particular, CR and CLR, were confirmed in A549 cells. 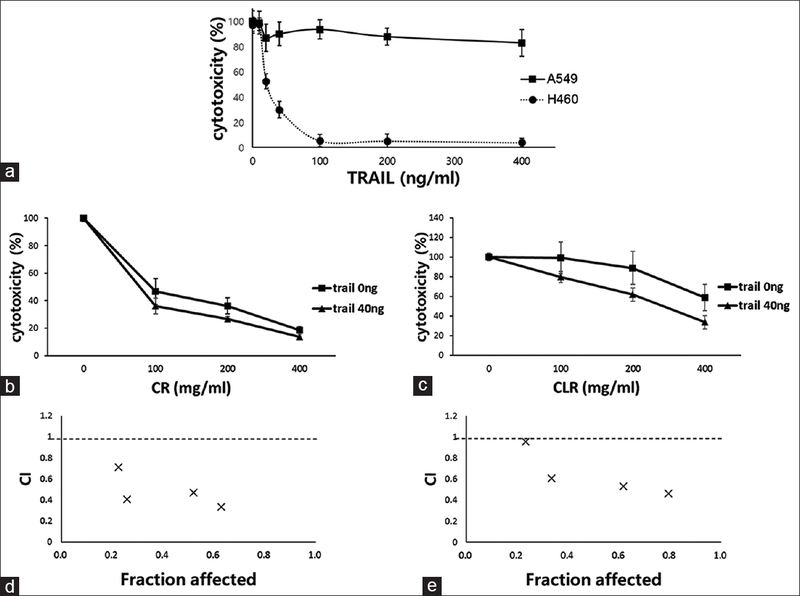 Therefore, CR and CLR showed potential to be used as candidates to overcome TRAIL resistance. Future studies to identify their underlying mechanism of action are required. Abbreviations used: TRAIL: Tumor necrosis factor-related apoptosis-inducing ligand; CLR: Curcumae longae Rhizoma; CR: Coptidis Rhizoma; NSCLC: non-small cell lung cancer. Background: Sophora tonkinensis Gapnep. is an important medical plant in China. Early researches of S. tonkinensis were focused on rapid propagation and quality analysis of in vitro tissue culture plantlet, and still no research focuses on the plant breeding of and there were no excellent varieties for artificial cultivation of S. tonkinensis. Objective: To set up a method to generate and select the best varieties of S. tonkinensis by polyploid breeding after induction by colchicine treatment. Materials and Methods: The adventitious buds were submerged in different concentrations of aqueous colchicine solution for different lengths of time to induce polyploidy in the plants, and the induced buds were identified by root-tip chromosome determination and leaf characteristics comparison. 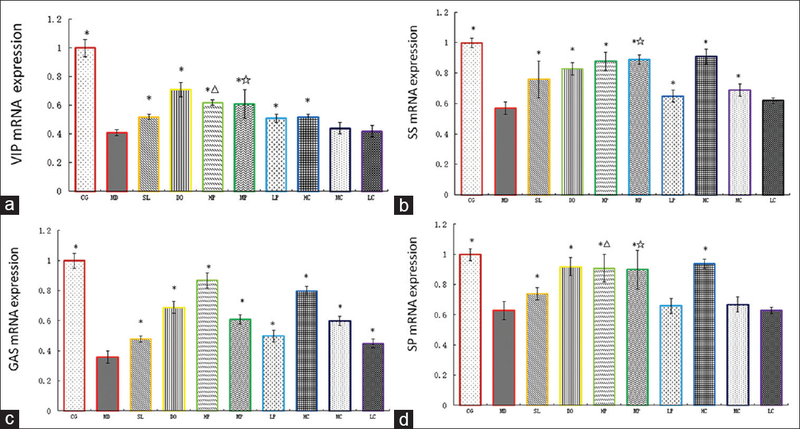 The contents of matrine and oxymatrine of radix ex rhizoma in 13 selected tetraploid lines were collected after 90 days in vitro rooting culture and were evaluated to provide evidence of good qualities of tetraploid S. tonkinensis. Results: The results showed that the highest percentage of tetraploid induction was 23.33% and occurred in the 0.2% (w/v) colchicine treatment for 30 h. Fifty lines of tetraploid plants were obtained and 12 of the 13 selected tetraploid lines exhibited higher productivity of total contents of matrine and oxymatrine when compared to controls. Conclusion: The data demonstrate that polyploidy induction can be beneficial for improving the medicinal value of S. tonkinensis. Abbreviations used: MS medium: Murashige and Skoog medium; BAP: 6-benzylaminopurine; NAA: A-naphthaleneacetic acid; IAA: Indole-3-acetic acid; KT: Kinetin; IBA: Indole-3-butyric acid; ABT: Rooting power. Background: Melissa officinalis L. is a well-known medicinal plant from the family Lamiaceae, which is distributed throughout Eastern Mediterranean region and Western Asia. Objective: In this study, response surface methodology (RSM) was utilized to optimize the extraction conditions for bioactive compounds from the leaves of M. officinalis L. Materials and Methods: A Box–Behnken design (BBD) was utilized to evaluate the effects of three independent variables, namely extraction temperature (°C), methanol concentration (%), and solvent-to-material ratio (mL/g) on the responses of the contents of caffeic acid and rosmarinic acid. Results: Regression analysis showed a good fit of the experimental data. The optimal condition was obtained at extraction temperature 80.53°C, methanol concentration 29.89%, and solvent-to-material ratio 30 mL/g. Conclusion: These results indicate the suitability of the model employed and the successful application of RSM in optimizing the extraction conditions. This study may be useful for standardizing production quality, including improving the efficiency of large-scale extraction systems. Abbreviations used: RSM: Response surface methodology, BBD: Box–Behnken design, CA: Caffeic acid, RA: Rosmarinic acid, HPLC: High-performance liquid chromatography. Background:DF formula is a herbal preparation comprised three medicinal herbs, namely, Ephedra intermedia, Rheum palmatum, and Lithospermum erythrorhizon, which is being used for the treatment of obesity and liver fibrosis in Korean local clinics. Objective: Since the abovementioned three herbs exist with different proportions in DF formula and their chemical markers have different physiochemical properties; it is quite challenging to develop an analytical methodology for the determination of these chemical markers. Materials and Methods: For the analysis of the three herbs, five chemicals, (+)-pseudoephedrine (1) and (−)-ephedrine (2) for E. intermedia, aloe-emodin (3), and chrysophanol (4) for R. palmatum, and shikonin (5) for L. erythrorhizon, were selected for method validation of DF formula, and the analytical conditions were optimized and validated using high-performance liquid chromatography coupled with an ultraviolet detector (HPLC-UV). 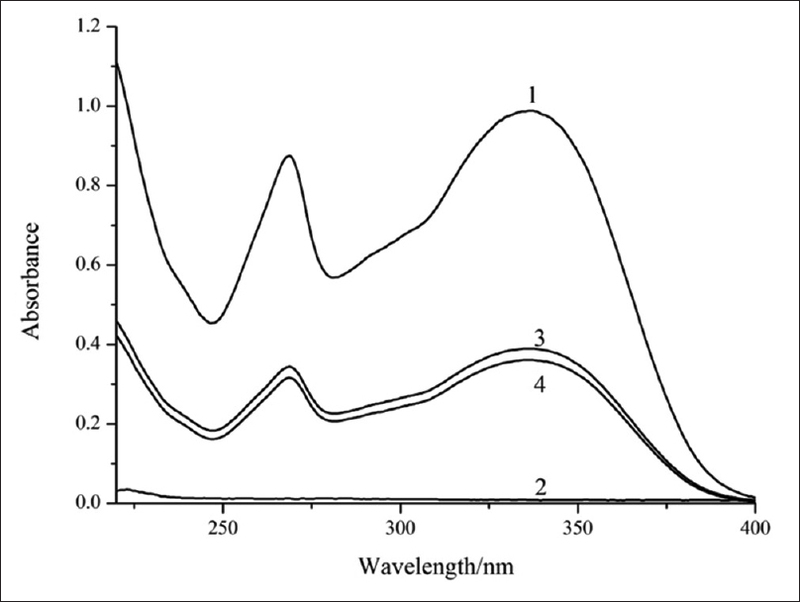 Results: The specificities for the five compounds 1–5 were determined by their UV absorption spectra (1–4: 215 nm and 5: 520 nm). Their calibration curves showed good linear regressions with high correlation coefficient values (R2 > 0.9997). The limits of detection of these five markers were in the range 0.4–2.1 ng/mL, with the exception of 5 (12.7 ng/mL). The intraday variability for all the chemical markers was less than a Relative standard deviation (RSD) of 3%, except for 5 (RSD = 12.6%). In the case of interday analysis, 1 (1.0%), 2 (3.1%), and 4 (3.7%) showed much lower variabilities (RSD < 5%) than 3 (7.6%) and 5 (8.2%). Moreover, the five chemical markers showed good recoveries with good accuracies in the range of 90%–110%. Conclusions: The developed HPLC-UV method for the determination of the five chemical markers of the components of DF formula was validated. Abbreviations used: EP: (−)-ephedrine; PSEP: (+)-pseudoephedrine; HPLC: High-performance liquid chromatography; UV: Ultraviolet; LOD: Limit of detection; LOQ: Limit of quantification; RSD: Relative standard deviation. Background: Diabetes mellitus (DM) is a metabolic disorder that occurs as a result of absolute or relative insufficiency of insulin release and/or insulin effect due to impairment of carbohydrate, fat and protein metabolism, and it is characterized by hyperglycemia and leads to various complications. Objective: In this study, it was aimed to investigate the effects of hesperidin (HP) and quercetin, which are natural flavonoids, on serum malondialdehyde (MDA), glutathione (GSH), tumor necrosis factor alpha (TNF-α), and interleukin-6 (IL-6) levels in rats with streptozotocin (STZ)-induced diabetes. Materials and Methods: The experimental animals were divided into four groups, each group comprising ten rats designated as follows: Group 1 served as control rats (C); Group 2 served as diabetic rats (DM); Group 3 served as diabetic rats administered HP (DM + HP) (100 mg/kg b. w.); and Group 4 served as diabetic rats administered quercetin (DM + Q) (100 mg/kg b. w.). Results: Serum MDA and GSH levels were significantly higher in STZ-induced DM group than control group (P < 0.05). In DM + HP and DM + Q groups, MDA levels were significantly decreased compared to DM groups (P < 0.05), but there was no significant difference GSH levels between DM, DM + HP, and DM + Q groups (P > 0.05). TNF-α levels in STZ-induced DM group were significantly decreased compared to control group (P < 0.05), and groups of DM + HP and DM + Q had higher serum TNF-α levels than STZ-induced DM group (P < 0.05). In STZ-induced DM group, serum IL-6 levels were decreased compared to control group (P < 0.05). Conclusion: As a result, in this study, we determined that HP and quercetin may play an effective role in regulating insulin metabolism metabolism in diabetes. However, considering the incompatibility of various results in the literature as well as our own results, we think that the actual role of cytokines in the pathogenesis of diabetes is one of the issues that need to be clarified in further studies. Abbreviations used: DM: Diabetes mellitus, MDA: Malondialdehyde, GSH: Glutathione; IL-6: Interleukin-6, TNF-α: Tumor necrosis factor alpha, HP: Hesperidin, Q; Quercetin, STZ: Streptozotocin, TC: Total cholesterol, TG: Triglyceride, HDL-C: High density lipoprotein cholesterol, LDL-C: Low density lipoprotein cholesterol, VLDL-C: Very-low-density lipoprotein cholesterol. Background: Cabbage, Brassica oleracea var. capitata L., is one of the most common vegetables in the world. Because of its high levels of flavonoids and anthocyanins, cabbage has long been used as a herbal medicine. The antioxidant and anti-inflammatory properties of cabbage were also recently been reported. Objective: This study was designed to investigate the anti-inflammatory effects of cabbage in mice with contact dermatitis (CD). Materials and Methods: We investigated the effects of methanol extract of B. oleracea var. capitata L. (MEBO) on ear swelling, erythema, and histopathological changes in CD mice. Moreover, the effects on cytokine production and the spleen/body weight ratio were investigated. Results: Topical treatment with MEBO inhibited ear swelling and erythema significantly. MEBO also significantly inhibited epidermal hyperplasia and infiltration of immune cells. 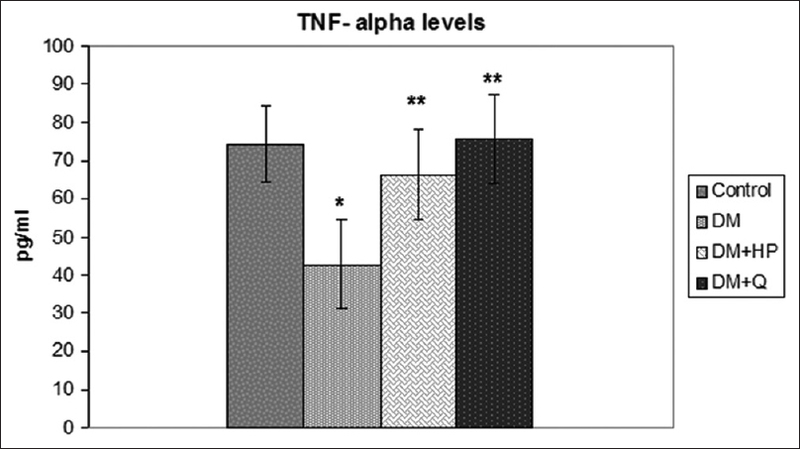 Furthermore, the levels of tumor necrosis factor-alpha, interferon-gamma, interleukin-6, and monocyte chemotactic protein-1 in inflamed tissues were effectively lowered by MEBO. Finally, MEBO did not affect body weight gain or spleen body weight ratio. Conclusions: These results indicate that cabbage can be used for the treatment of skin inflammation and that its anti-inflammatory activity is closely related to the inhibition of Th1 skewing reactions. Abbreviations used: AOO: Acetone and olive oil (4:1), CBA: Cytometric bead array, CD: Contact dermatitis, DEX: Dexamethasone, DNFB: 1-fluoro-2,4-dinitrofluorobenzene, GM-CSF: Granulocyte-macrophage colony-stimulating factor, ICAM-1: Intercellular Adhesion Molecule-1, LPS: Lipopolysaccharide, MEBO: Methanol extract of Brassica oleracea, MCP-1: Monocyte chemotactic protein-1, NO: Nitric oxide. Background: Medicinal herbs are significantly effective against a variety of liver disorders and Trapa natans was traditionally used for the treatment of anti-inflammatory, pain disorder, and various types of hepatic ailment. Objective: The purpose of this study was to evaluate the hepatoprotective activity of T. natans fruit peel extract against antitubercular drugs (isoniazid + rifampicin [INH + RIF])-induced hepatotoxicity in rats. Materials and Methods: Liver toxicity was induced by INH + RIF at a dose level of 50 mg/kg each, intraperitoneally. for 15 days. Fifty percent ethanolic extract of T. natans (TNE) at a dose of 200 and 400 mg/kg was administered orally once daily for 15 days. The hepatoprotective activity was assessed using various biochemical parameters such as aspartate transaminase, alanine transaminase, alkaline phosphate, lactate dehydrogenase, albumin, cholesterol, and bilirubin. Furthermore, in vivo antioxidant activities and histopathological investigation were performed to assess hepatoprotective activity. Results: Obtained results demonstrated that the level of liver marker enzymes and antioxidant parameters were significantly altered by INH + RIF treatment. Treatment with T. natans peel extract causes significant (P < 0.01 to P < 0.001) reduction in liver injury & normalized all altered liver marker enzymes. In addition, TNE significantly normalized the activity of antioxidant enzymes, namely, lipid peroxidation (P < 0.01 to P < 0.001), reduced glutathione (P < 0.05 to P < 0.001), superoxide dismutase (P < 0.05 to P < 0.001), and catalase (P < 0.01 to P < 0.001) in the liver tissue of INH + RIF-treated groups. Histological observations of the liver tissues correlated with the biochemical observations. Conclusion: These findings powerfully support that the protective effect of T. natans fruit peel extract against liver injury which may be attributed to its hepatoprotective activity due to normalizes the altered liver marker enzymes and antioxidant defense status and thereby contributed to its antihepatotoxic potential. Abbreviations used: INH: Isoniazid; RIF: Rifampicin; DIH: Drug-induced hepatotoxicity; CMC: Carboxy methyl cellulose; ALT: Alanine transaminase; ALP: Alkaline phosphate; CHL: Total cholesterol; ALB: Albumin; LDH: Lactate dehydrogenase; LPO: Lipid peroxidation; CAT: Catalase; GSH: Reduced glutathione; SOD: Superoxide dismutase; TNE: Trapa natans extract. Background: Garcinia mangostana is extensively used in most of the Indian herbal pharmaceuticals and nutraceuticals. Objective: The objective of this study was to elucidate the underlying biochemical protective mechanism of G. Mangostana Linn. fruit extract (GME) in deterioration of diethylnitrosamine (DEN)-induced hepatic carcinoma (HCC) in rats. 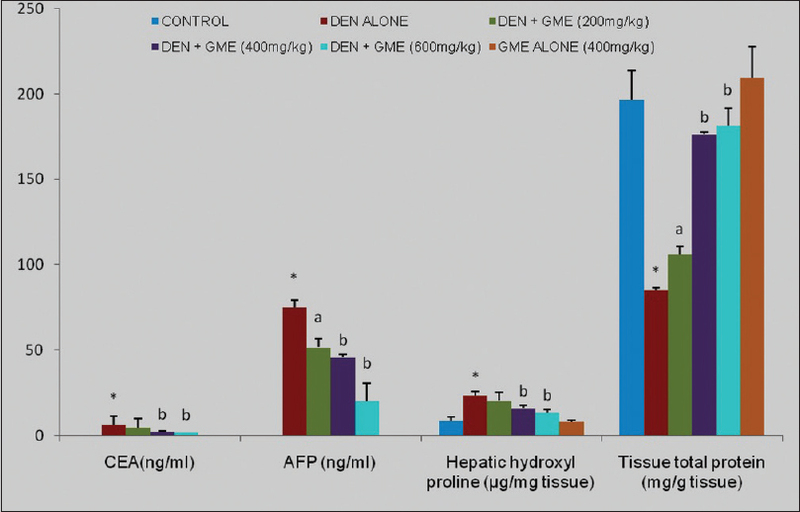 Materials and Methods: The cancer was induced using DEN to the experimental rats and treated with GME (200, 400, and 600 mg/kg) to find its anticancer property. The cancer biomarkers such as alpha-fetoprotein (AFP), carcinoembryonic antigen (CEA), hepatic hydroxyl proline, total tissue protein, and tumor necrosis factor-alpha levels were measured using ELISA. The vascular endothelial growth factor expressions were also seen in liver tissues using immunohistochemistry. Results: In addition, there was a significant increase in serum AFP, CEA, hepatic hydroxylproline, and total tissue protein levels in HCC group versus the negative control group. In contrast, the groups with HCC subjected to either high or low dose of GME elicited significant reduction of AFP, CEA, hepatic hydroxylproline, and increase in total protein in serum compared to the untreated HCC rats. Interestingly, treatment with GME elicited marked improvement in the liver histological feature and downregulation of tumor necrosis factor-alpha levels in HCC groups. GME extract may have chemopreventive benefits by reducing the tumor promoting growth factor levels in HCC-induced group. Conclusion: To sum up, all findings on curative groups had proved clearly that the GME has anticarcinogenic effect on the development of liver cancer induced by DEN in rats. Abbreviations used: TNF-α: Tumor necrosis factor-alpha, PBS: Phosphate buffered saline, ROS: Reactive oxygen species, DNA: Deoxyribonucleic acid, GSH: Glutathione, VEGF: Vascular endothelial growth factor. Background: Academic reports have confirmed Moringa oleifera leaves to possess significant antioxidant capacities; however, such studies are unavailable for its ripe seeds even though they are more desirous for consumption due to their sweet taste. Objective: In this study, we investigated antioxidant capacities of four polar extracts (crude water, ethanol, butanol, and aqueous residue) from the plant's ripe seeds. Materials and Methods: Phytochemicals were extracted from the ripe seeds of M. oleifera using ethanol and water solvents at initial stage. Butanol and aqueous residue were then subsequently fractioned out from the ethanol extract. Phenolic and flavonoid contents of the polar extracts were determined. Then, their antioxidant capacities were quantified by 2,2'-azino-bis(3-ethylbenzothiazoline-6-sulfonic acid) (ABTS) and 2,2-diphenyl-1-picrylhydrazyl (DPPH) radical scavenging assays. Finally, gas chromatography-mass spectrometry (GC-MS) analyses of the extracts were performed. Results: DPPH and ABTS tests showed that the polar extracts possess significant antioxidant capacities that ranged from 29 to 35.408 μM Trolox equivalence antioxidant capacity (TEAC)/mg sample and 7 to 29 μM TEAC/mg sample, respectively. The antioxidant capacities of the extracts corresponded to their phenolic and flavonoid contents that varied from 13.61 to 20.42 mg gallic acid equivalence/g sample and 0.58 to 9.81 mg quercetin equivalence/g sample, respectively. Finally, GC-MS analyses revealed antimicrobial phenolic compounds, 4-hydroxybenzaldehyde in crude water extract and 4-hydroxybenzene acetonitrile in the ethanol and butanol extracts, and aqueous residue. Conclusion: Our results established that M. oleifera ripe seeds have significant antioxidant activity which may be due to its phenolic and nonphenolic compounds content. Abbreviations used: ABTS: 2,2'-azino-bis(3-ethylbenzothiazoline-6-sulfonic acid); DPPH: 2,2-diphenyl-1-picrylhydrazyl; TEAC: Trolox equivalence antioxidant capacity; QE: Quercetin equivalence; GAE: Gallic acid equivalence; GC-MS: Gas chromatography-mass spectrometry. Background: Inhabitants of the Eastern Cape Province of South Africa use the roots of Dianthus thunbergii and corms of Hypoxis argentea to treat diabetes mellitus and other ailments. Objective: The objective of this study was to analyze the phytochemical composition and antioxidant activities of the aqueous and ethanol extracts of the roots and corms of two plants. Materials and Methods: Total phenolics, flavonoids, flavonols, proanthocyanidins, tannins, and alkaloids were determined by standard methods. The scavenging activities of the extracts against 1,1 diphenyl-2-picrylhydrazyl (DPPH), 2'-azino-bis (3-ethylbenthiazoline-6-sulfonic acid (ABTS), nitric oxide (NO), hydrogen peroxide (H2O2), and their ferric-reducing antioxidant potentials (FRAPs) were measured. 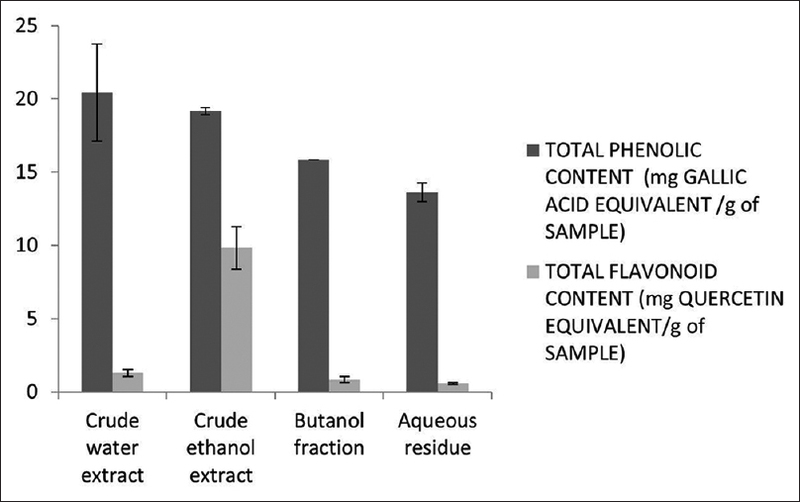 Results: The ethanol extract of H. argentea had the highest content of phenolics (66.71 ± 2.71 mg gallic acid equivalent/g) and tannins (1.18 ± 0.07 mg TAE/g), while the ethanol extract of D. thunbergii gave higher contents of flavonoids and proanthocyanidins (62.21 ± 1.75 mg Qe/g and 432.62 ± 2.43 mg Ca/g, respectively). Flavonols were the most predominant in the aqueous extract of H. argentea (25.51 ± 1.92 mg Qe/g). We observed a concentration-dependent response in the ABTS- and H2O2-scavenging activities and FRAP values of the extracts and standards (Vitamin C, butylated hydroxytoluene, and rutin). The ethanol extracts of both plants generally demonstrated better antioxidant activities against H2O2, NO, and ABTS while also possessing better reducing power than the aqueous extracts. The aqueous extract of D. thunbergii, however, showed the best DPPH scavenging activity. Conclusion: The higher content of phytochemicals and antioxidant capacity obtained for the ethanol extracts of D. thunbergii and H. argentea may prove to be valuable information in selecting suitable extraction solvents for the medicinal applications of both plants. Abbreviations used: ABTS: 2'-azino-bis (3-ethylbenthiazoline-6-sulfonic acid); BHT: Butylated hydroxytoluene; DPPH: 1,1 diphenyl-2-picrylhydrazyl; DTA: Dianthus thunbergii aqueous extract (16.6%); DTE: Dianthus thunbergii ethanol extract (2.4%); Fe3+-TPTZ: Ferric tripyridyltriazine; FRAP: Ferric-reducing antioxidant potentials; GAE: Gallic acid equivalent; HAA: Hypoxis argentea aqueous extract (3.2%); HAE: Hypoxis argentea ethanol extract (1.8%); Qe: Quercetin equivalence; ROS: Reactive oxygen species; TBA: Thiobarbituric acid;TCA: Trichloroacetic acid. Background: The apigenin has important medicinal value. However, the low solubility of apigenin in water significantly reduced its application. Objective: In this study, the apigenin was extracted, and the complex of apigenin and lecithin was obtained by the solvent method and its physical and chemical properties were investigated. Materials and Methods: The apigenin was extracted from the leaves of Adinandra nitida. Afterward, its apigenin was obtained by hydrolysis and recrystallization. The solvent method was used to synthesis the complex of apigenin and lecithin. Tetrahydrofuran was used as the solvent. The physicochemical properties of the complex were investigated by the various methods such as ultraviolet (UV)-visible spectrometry, infrared spectrometry (IR), scanning electron microscopy (SEM), differential scanning calorimetry (DSC), and X-ray diffractometry. Results: No distinct difference was examined between the complex and physical mixture according to the UV analysis. While the result of Fourier transform-IR analysis indicated the characteristic absorption peaks of apigenin was subdued by the absorption peaks of lecithin. SEM showed the irregular form of the complex. In the DSC thermogram of the complex, the characteristic endothermic peak belonging to apigenin disappears, and the apparent amorphous properties are shown in the X-ray X-diffractograms of the complex. Conclusion: The synthetic process does not break the conjugated structure of apigenin. The complex is held together by Hydrogen bonding and van der Waals force and processes new physical and chemical characteristics. The industrial application of apigenin might be enhanced by the increase of the bioavailability. Abbreviation used: SLA: The synthesis of the complex of soy lecithin and apigenin, PMSLA: The manufacture of a physical mixture of soybean lecithin and apigenin, UV: Ultraviolet, IR; Infrared Radiation, FT-IR: Fourier transform infrared, NMR: Nuclear magnetic resonance, SEM: Scanning electron microscopy, DSC: Differential scanning calorimetry, XRD: X-ray diffractometry. 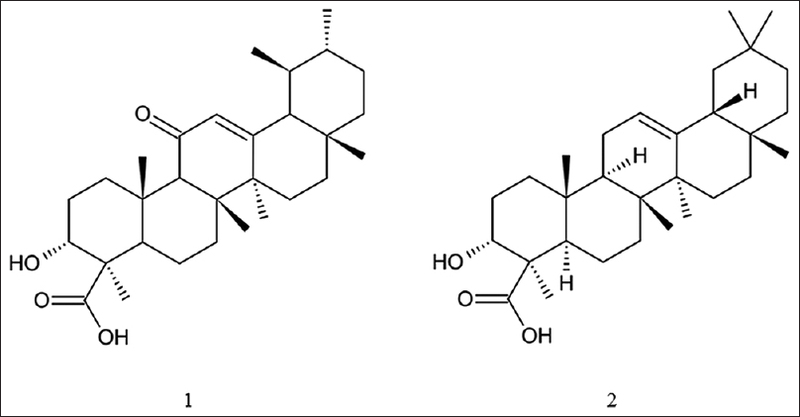 Background: Oroxin B (OB) is one of flavonoids isolated from traditional Chinese herbal medicine Oroxylum indicum (L.) Vent. Recent studies suggest that flavonoids have obvious anti-liver tumors effect, but the precise molecular mechanism is still unclear. Objective: The current study was performed to investigate the antitumor effects of OB on human hepatoma cell line SMMC-772 and explore the part of molecular mechanisms in this process. Materials and Methods: MTT method, terminal deoxynucleotidyl transferase dUTP nick end labeling assay and flow cytometry were utilized to detect the inhibition of proliferation and the apoptosis after treating OB in of SMMC-7721 cells. The mRNA and proteins expressions of COX-2, vascular endothelial growth factor (VEGF), phosphatidylinositol-3-kinase (PI3K), p-AKT, and PTEN were measured by a real-time polymerase chain reaction and Western Blot method. Results: The results showed that OB inhibited proliferation of SMMC-7721 cell in a dose-dependent manner, and induced its apoptosis. Moreover, OB unregulated PTEN and downregulated COX-2, VEGF, p-AKT, and PI3K. Conclusion: Our results demonstrated that OB significantly inhibits proliferation and induce apoptosis, which may be strongly associated with the inhibiting COX-2/VEGF and PTEN/PI3K/AKT pathway signaling pathway in SMMC-7721 cells, OB potentially be used as a novel therapeutic agent for liver cancer. Abbreviations used: OB: Oroxin B; MTT: 3-(4,5-dimethyl-2-thiazolyl)-2,5-diphenyl-2-H-tetrazolium bromide; COX-2: cyclooxygenase-2; PI3K: phosphatidylinositol 3 kinase; PTEN: Phosphatase and tensin homolog deleted on chromosome ten; VEGF: Vascular endothelial growth factor; RT-PCR: Reverse transcription polymerase chain reaction; DAPI: Diamidino 2 phenylindole; PBS: Phosphate buffer saline; FITC: Fluorescein isothiocyanate; PI: Propidium Iodide; RIPA: Radio immunoprecipitation assay lysis buffer; PMSF: Phenylmethanesulfonyl fluoride; PAGE: Polyacrylamide gel electrophoresis. Background: The rhizome of Atractylodes lancea (AL) is usually used for the treatment of various diseases such as spleen deficiency syndrome (SDS). Both bran-processed and crude AL is included in Chinese Pharmacopoeia. The different efficacies of bran-processed and crude AL on SDS are largely unknown, and the mechanisms of AL effects have not been fully elucidated. Objective: The objective of the study was to compare the effects of bran-processed and crude AL and then assess the mechanisms of treating SDS. Materials and Methods: The model of SDS in rats was established using excessive exertion, combined with an irregular diet and intragastric administration of the extract of Sennae Folium, and different doses of bran-processed and crude AL were gavaged. The serum was analyzed by an enzyme-linked immunosorbent assay (ELISA), and small intestinal tissues were analyzed by reverse transcription-polymerase chain reaction (RT-PCR). Results: The injury of SDS was alleviated by the treatment of bran-processed and crude AL. Compared to model group, the indexes of trypsin (TRY), amylase (AMS), vasoactive intestinal peptide (VIP), somatostatin (SS), gastrin (GAS), substance P (SP), Na+-K+-ATPase, and succinic dehydrogenase in serum of each administration group were increased by ELISA, and the mRNA expressions of VIP, SS, GAS, and SP in small intestinal tissues were increased by RT-PCR. Furthermore, in a dose-dependent manner, the bran-processed and crude AL increased the levels of TRY, AMS, VIP, and GAS and the mRNA expression levels of VIP. Compared with the crude AL, the bran-processed AL was more effective in treating SDS. Conclusion: Through the mechanisms of treating SDS by AL, both bran-processed and crude AL has alleviated the symptoms of SDS. Abbreviations used: AL: Atractylodes lancea; TRY: Trypsin; AMS: Amylase; VIP: Vasoactive intestinal peptide; SS: Somatostatin; GAS: Gastrin; SP: Substance P; ELISA: The enzyme-linked immunosorbent assay; mRNA: Messenger ribonucleic acid; SDH: Succinic dehydrogenase; RT-PCR: Reverse transcription-polymerase chain reaction; TCM: Traditional Chinese medicine; SDS: Spleen deficiency syndrome. Background: Inhibition of adipogenesis has been a therapeutic target for reducing obesity and obesity-related disorders such as diabetes, hypertension, atherosclerosis, and cancer. For decades, anti-adipogenic potential of many herbal extracts has been investigated. One example is Garcinia cambogia extract (GE) containing (-)-hydroxycitric acid as an active ingredient. GE is currently marketed as a weight loss supplement, used alone or with other ingredients. Pear pomace extract (PE), another natural product, has been also shown to have anti-adipogenic activity in a recent report. Objective: It was tested if the mixture of PE and GE (MIX) would produce more effective anti-adipogenic activity than PE or GE alone. Materials and Methods: Differentiation of 3T3-L1 preadipocyte was induced by adding insulin, dexamethasone, and isobutylmethylxanthine and lipid accumulation was measured by Oil Red O staining. 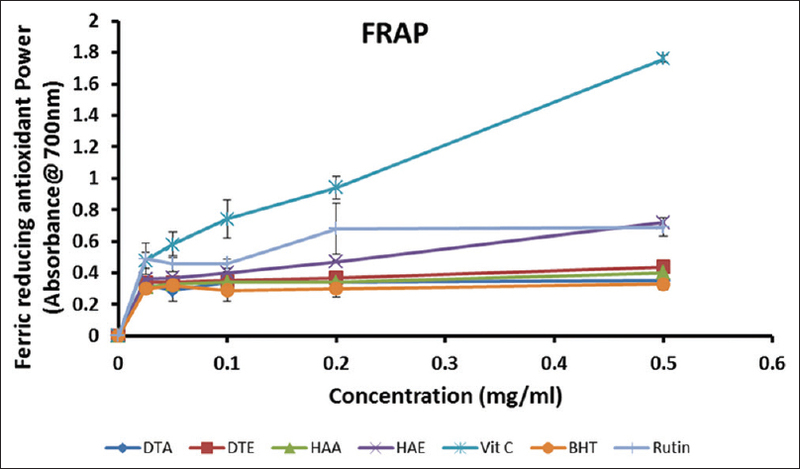 Cellular markers for adipogenesis and lipolysis such as CCAAT/enhancer binding protein (C/EBP-α), peroxisome proliferator-activated receptor gamma (PPAR-γ), fatty acid synthase (FAS), and hormone-sensitive lipase (HSL) was measured using immunocytochemistry. Results: MIX, compared to PE or GE alone, showed greater inhibition of lipid accumulation. Furthermore, MIX reduced the expression of adipogenesis-related factors C/EBP-α, PPAR-γ, and FAS more than PE or GE alone did. 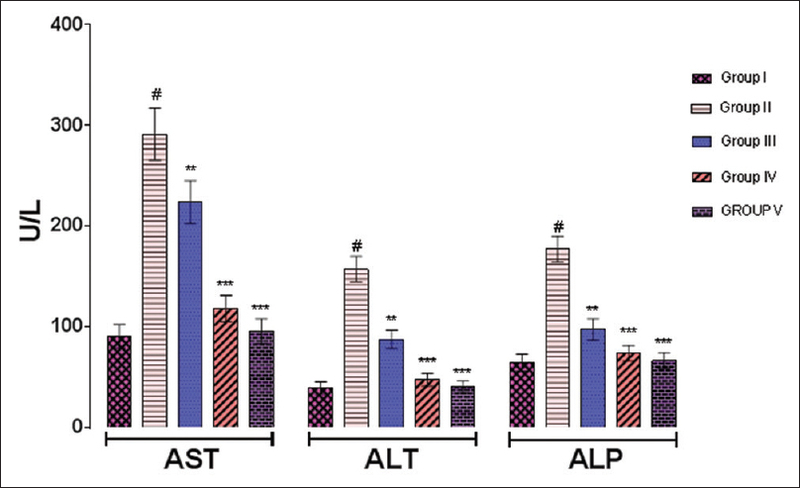 In contrast, the expression of HSL the enzyme required for lipolysis was further enhanced in MIX-treated adipocytes compared to the PE or GE alone treated groups. Conclusions: Anti-adipogenic effect of PE and GE appears synergistic, and the MIX may be a useful therapeutic combination for the treatment of obesity and obesity-related diseases. Abbreviations used: CEBP-a: CCAT/enhancer binding protein alpha, CI: Combination Index, FAS: Fatty acid synthase, GE: Garcinia cambogia extract, HSL: Hormone sensitive lipase, PE: Pear pomace extract, PPAR-γ: Peroxisome proliferator-activated receptor gamma. Background: Medicinal fern species represent a potentially important source for both food and medicinal applications. Previously, two underutilized tropical fern species (Blechnum orientale and Phymatopteris triloba) were reported with cytotoxic activities against selected cancer cell lines. However, the exact mechanism remains elusive. Objective: In this paper, we reported the identification of six differentially expressed proteins isolated from cancer cells, following exposure to the cytotoxic fern extracts. Materials and Methods: The identities of these cancer proteins were determined by matrix-assisted laser desorption ionization time-of-flight protein sequencing. Results: The cancer proteins were identified as follows: elongation factor 1-γ, glyceraldehydes-3-phosphate dehydrogenase, heat shock protein 90-β, heterogeneous nuclear ribonucleoprotein-A2/B1, truncated nucleolar phosphoprotein B23, and tubulin-β chain. To the best of our knowledge, this paper represents thefirst time these cancer proteins are being reported, following exposure to the aforementioned cytotoxic fern extracts. Conclusion: It is hoped that further efforts in this direction could lead to the identification and development of target-specific chemotherapeutic agents. Abbreviations used: EF: Elongation factor; HRP: Horseradish peroxidase; HSP: Heat shock protein; MALDI: Matrix-assisted laser desorption/ionization. Background: Marine organisms are established to be a wealthy source of bioactive compounds with diverse chemical structures and bioactivities. Acanthostrongylophora ingens is known to be rich with pyrimidine b-carboline and manzamine-type alkaloids. The goal of the present work is to isolate and identify new alkaloids from A. ingens as well as to assess the cytotoxic potential of these metabolites towards various cancer cell lines. Methods: The crude MeOH extract of the sponge was separated by vacuum liquid chromatography (VLC), using n-hexane, EtOAc, and MeOH. The EtOAc fraction was chromatographed on VLC, SiO2, sephadex LH-20, and RP18columns, affording four metabolites. Their structures were identified using infrared, ultraviolet, high-resolution mass spectrometry, and nuclear magnetic resonance spectroscopic techniques, as well as comparison with the published data. 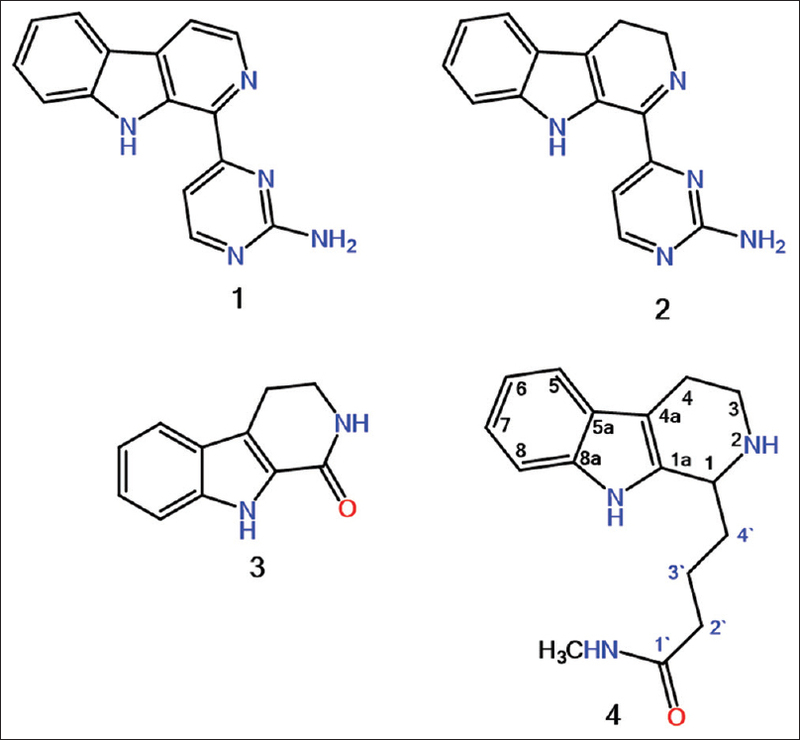 Results: A new 1,2,3,4-tetrahydro-β-carboline (THβCs) alkaloid, ingenine F (4) and three known compounds: Annomontine (1), acanthomine A (2), and 1-oxo-1,2,3,4-THβCs (3) were isolated and identified. 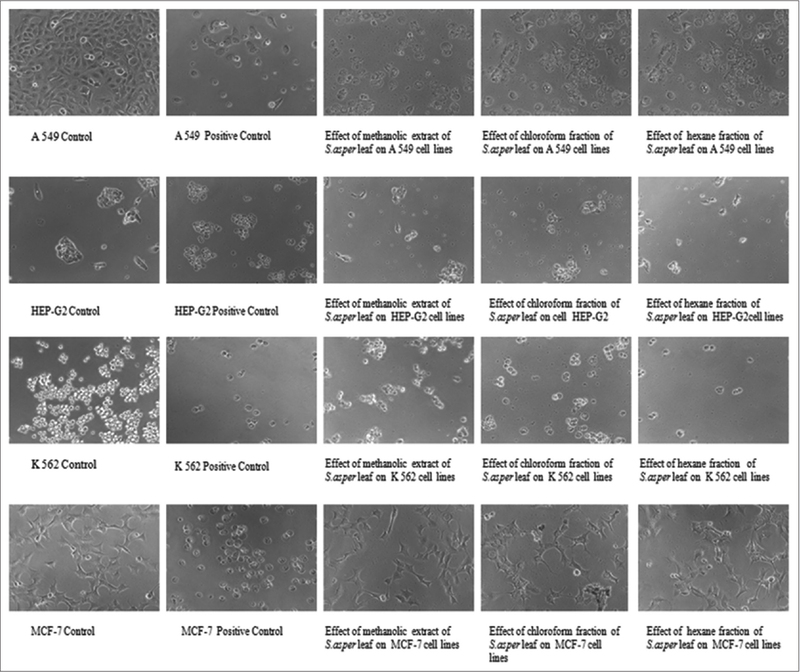 Ingenine F (4) exhibited cytotoxic activity toward hormone-dependent breast carcinoma (MCF7), colon carcinoma (HCT116), and lung carcinoma (A549) cell lines with IC50 values of 2.82, 1.00, and 2.37 μM, respectively, compared to doxorubicin (IC50 0.012, 0.036, and 0.102 μM, respectively). Conclusion: It is thefirst report for the isolation of THβCs alkaloids from A. ingens. The THβCs alkaloid with N-methylbutyramide unit as found in ingenine F is very rarely encountered in nature. Ingenine F may provide new promising candidates for potential cytotoxic agent. Abbreviations used: 1D: One-dimensional; 2D: Two-dimensional; CC: Column chromatography; COSY: Correlations spectroscopy; DMSO: Dimethyl sulfoxide; HMBC: Heteronuclear multiple bond correlation experiment; HRESIMS: High resolution electrospray ionization mass spectrometry; HSQC: Heteronuclear single quantum correlation; IR: Infrared; LCQ: Liquid chromatography quadrupole; LTQ: Linear trap quadropole; NMR: Nuclear magnetic resonance; RP: Reversed phase; SiO2: Silica gel; TLC: Thin-layer chromatography; UV: Ultraviolet; VLC: Vacuum liquid chromatography. Background: Boswellia carteri Bridw. is being widely used for its anti-inflammatory properties, as well as for wound healing, antimicrobial, and immunomodulatory properties, and boswellic acids (BAs) are considered to be the main active constituents. Objectives: To investigate optimal conditions of stir-baking process for the resin of B. carteri with vinegar of using response surface methodology (RSM). Materials and Methods: The concentration of acetic acid, heating temperature, and heating time were set as influential factors, and the yields of chemical compounds were the response values which were optimally designed by a Box–Behnken design. 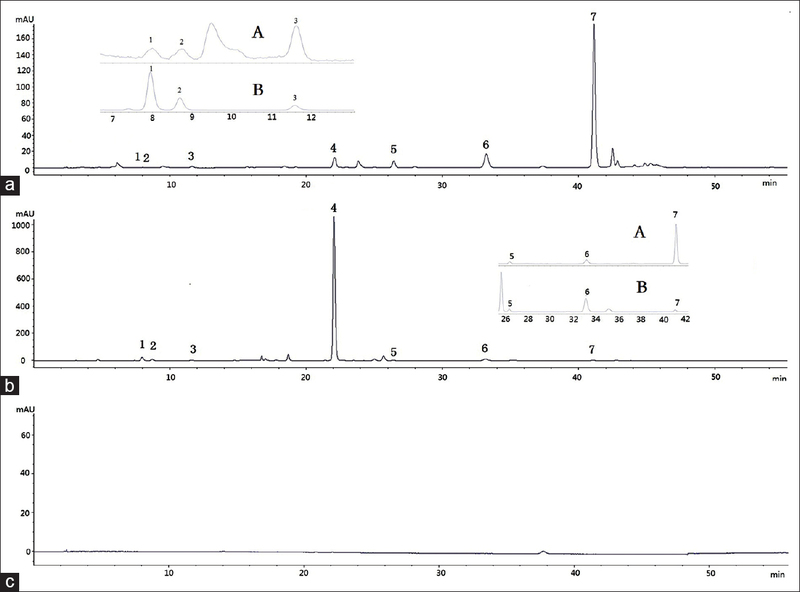 The amounts of 11-keto-β-boswellic acid (KBA) and α-boswellic acid (αBA) in B. carteri resin were quantified using high-performance liquid chromatography analysis. Results: Maximum amounts of KBA and αBA in B. carteri resin were obtained using 6% acetic acid for 10 min at 90°C in preliminary test. Two factor interactions, such as acetic acid concentration–heating temperature and heating temperature–heating time, were significantly observed by multiple regression analysis. Optimal processing conditions from RSM were 5.83% for acetic acid concentration, 9.56 min for heating time, and 89.87°C for heating temperature. Under the modified conditions, the experimental value of the response was 11.25 mg/g, which was similar to the predicted value. Conclusions: The results suggest that the optimal conditions for the stir-baking process of B. carteri resin were determined by RSM, which was reliable and applicable to practical processing of herbal medicine. Abbreviations used: BAs: Boswellic acids; KBA: 11 keto β boswellic acid; αBA: α boswellic acid; BBD: Box–Behnken design; RSM: Response surface method; HPLC: High performance liquid chromatography; LOD: Limits of determination; LOQ: Limits of quantification; RSD: Relative standard deviation; ANOVA: Analysis of variance. Introduction: Spirulina maxima was used as important nutritional source in the Aztec civilization because it is rich in proteins and vitamins. It contains various antioxidants such as phycocyanin and flavonoids. Based on abundant antioxidants, S. maxima is known to possess anti-inflammatory effect, especially on neuronal cells. Materials and Methods: S. maxima was extracted in water and contain of phycocyanin was identified by high-performance liquid chromatography. Cell viability test was performed with treatment of S. maxima extract. After, oxidative stress-related mechanisms were evaluated by detecting the accumulation of reactive oxygen species (ROS) and Ca2+ influx, and decrease of mitochondrial membrane potential (MMP) level. Then, the glutathione (GSH) related assays were conducted. Results: The water extracted S. maxima exerted the neuroprotective activity by attenuating the ROS and Ca2+ formation, maintaining the MMP level, and protecting the activity of the antioxidant enzymes by increasing reduced GSH against oxidative stress compared to control. Conclusion: The results suggested that water extracted S. maxima showed powerful neuroprotective effect through the mechanism related to antioxidant activity, able to preventing the radical-mediated cell death. Abbreviations used: ROS: Reactive oxygen species; MMP: Mitochondrial membrane potential; GSH: Glutathione; GSSG: Glutathione disulfide, oxidized glutathione; GPx: Glutathione peroxidase; GR: Glutathione reductase; DMEM: Dulbecco's modified Eagle's medium; FBS: Fetal bovine serum; DCF-DA: 2',7'-dichlorofluorescein diacetate; PBS: Phosphate buffered serum; Rho 123: Rhodamine 123; NADPH: Nicotinamide adenine dinucleotide phosphate; DTNB: 5,5'-dithiobis-2-nitrobenzoic acid, Ellman's reagent; GSSG-R: Glutathione disulfide reductase; MTT: 3-(4,5-dimethylthiazol-2-yl)-2,5-diphenyltetrazolium bromide; DMSO: Dimethyl sulfoxide; HPLC: High-performance liquid chromatography. Background: At present, approximately 17–25 million people in the world suffer from Alzheimer's disease (AD). The most efficacious and acceptabletherapeutic drug clinically are the acetylcholinesterase inhibitors (AChEIs). Yinhuang oral liquid is a Chinese medicine preparation which contains AChEIs according to the literatures. However, no strategy has been presented for rapid screening and identification of AChEIs from Yinhuang oral liquid. Objective: To develop a method for rapid screening and identification of AChEIs from Yinhuang oral liquid using ultrafiltration–liquid chromatography–electrospray ionization tandem mass spectrometry (UF-LC-ESI-MS/MS). Materials and Methods: In this study, UF incubation conditions such as enzyme concentration, incubation time, and incubation temperature were optimized so as to get better screening results. The AChEIs from Yinhuang oral liquid were identified by high-performance liquid chromatography-ESI-MS and the improved Ellman method was used for the AChE inhibitory activity test in vitro. Results: The results showed that Yinhuang oral liquid can inhibit the activity of AChE. We screened and identified seven compounds with potential AChE inhibitory activity from Yinhuang oral liquid, which provided experimental basis for the treatment and prevention of AD. Conclusion: The current technique was used to directly screen the active ingredients with acetylcholinesterase inhibition from complex traditional Chinese medicine, which was simple, rapid, accurate, and suitable for high-throughput screening of AChEI from complex systems. Abbreviations used: (AD): Alzheimer's disease; (UF-LC-ESI-MS/MS): ultrafiltration–liquid chromatography–electrospray ionization tandem mass spectrometry; (AChEIs): acetylcholinesterase inhibitors. Background: Berberine hydrochloride (BH) is widely used as a nonprescription drug to treat diarrhea without drug resistance and side effects worldwide. However, its drastic bitterness affects patient compliance severely. Hence, it is essential to mask the bitter taste of BH. Objective: Powder surface modification technology is attempted to mask the bitterness of BH through changing the surface properties in vibromill. The purpose of this study was to apply this technology to mask the bitterness of BH and improve the patient compliance. Materials and Methods: Initially, to prepare the modifier-BH composites, some parameters were optimized, including type of modifiers, ratio between BH and modifiers, and composite time. Then, the contact angles, scanning electron microscopy, and infrared (IR) spectroscopy were utilized to evaluate the microstructure of composites. Moreover, electronic tongue measurement, animal performance test, and bitterness evaluation methods were applied to evaluate the masking effect. Results: Based on the results of bitter taste evaluations, mannitol was chosen as the best modifier, and the optimal ratio of BH and mannitol was 6:4 with grinding together for 2 min in vibromill. For the composites prepared by this process, the IR spectroscopy and surface properties were similar with that of mannitol, and the microstructure was also demonstrated that small particles of mannitol successfully coated on the surface of BH. Special structure of the composites decreased the contact area between BH and external media and finally inhibited the bitterness. This effect was confirmed by three different kinds of methods. Conclusion: Our study provides a novel method to mask the bitter taste of drugs. 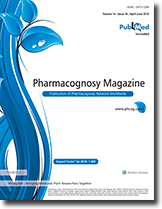 It will be of great interest to pharmaceutical experts and pharmacists. Abbreviations used: BH:Berberine hydrochloride; CDI: Clostridium difficile infection; ODT: Orally disintegrating tablets; HPLC: High-performance liquid chromatography; CAs: Contact angles; SEM: Scanning electron microscopy; IR: Infrared spectrogram. Background: Cyperus rotundus L. (family Cyperaceae), native to India, is a multivalent medicinal plant widely used in conventional medicine. 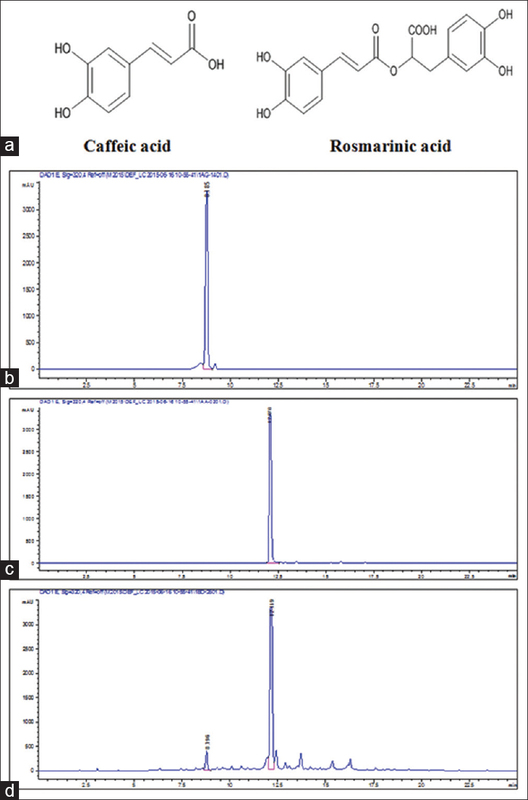 The research reports on bioactive components from C. rotundus L. are scanty. Objective: The objective of the study was to optimize the best solvent system and bioprospect the possible phytochemicals in C. rotundus L. rhizome (CRR). Materials and Methods: The phytochemicals were extracted from the rhizomes of C. rotundus L. by successive Soxhlet technique with solvents of increasing polarity. The resultant extracts were analyzed for their total flavonoid content (TFC), total phenolic content (TPC), total proanthocyanidin content (TPAC), in vitro antioxidant potential, and inhibition of lipid peroxidation. The 70% acetone extract of CRR was analyzed using gas chromatography–mass spectrometry (GC-MS) for probable phytochemicals. Results and Discussion: The TPC, TFC, and TPAC estimates ranged from 0.036 ± 0.002 to 118.924 ± 5.946 μg/mg extract, 7.196 ± 0.359 to 200.654 ± 10.032 μg/mg extract, and 13.115 ± 0.656 to 45.901 ± 2.295 μg/mg extract, respectively. The quantities of TPC, TFC, and TPAC were found to be the highest in 70% acetone extract. The 70% acetone and 70% methanol extracts revealed best radical scavenging effect. GC-MS analysis of CRR extract revealed the presence of a novel compound 1 (2)-acetyl-3 (5)-styryl-5 (3)-methylthiopyrazole. Conclusion: The study indicated that 70% acetone and 70% methanol extracts of CRRs can be a potential source of antioxidants. Abbreviations used: ACRE: Acetone C. rotundus L. rhizome extract; AlCl3: Aluminum chloride; AQRE: Aqueous C. rotundus L. rhizome extract; CE: Catechin Equivalent; CHRE: Chloroform C. rotundus L. rhizome extract; CRR: C. rotundus L. rhizome; DPPH: 2,2 diphenyl-1-picrylhydrazyl; ETRE: Ethanolic C. rotundus L.rhizome extract; EARE: Ethyl acetate C. rotundus L.rhizome extract; FRP: Ferric reducing power; GAE: Gallic acid equivalent; GC-MS: Gas chromatography-mass spectrometry; HERE: Hexane C. rotundus L.rhizome extract; MERE: Methanolic C. rotundus L.rhizome extract; PERE: Petroleum ether C. rotundus L.rhizome extract; QE: Quercetin equivalent; RNS: Reactive nitrogen species; ROS: Reactive oxygen species; TFC: Total flavonoid content; TPC: Total phenolic content; TPAC: Total proanthocyanidin content. 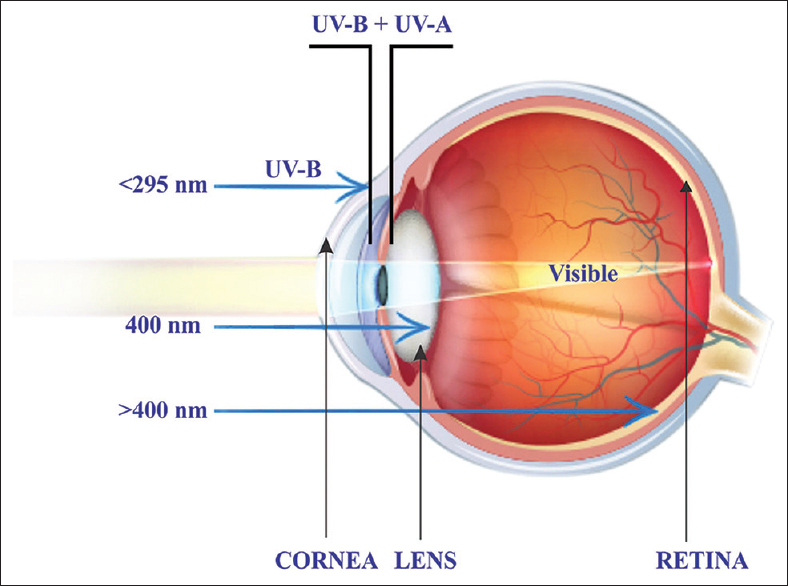 Background: Human eye is constantly exposed to different wavelengths and intensities of light. Oxidative stress results in distinct changes to retinal organs and tissues. Macular pigments (lutein and zeaxanthin), present in the central macular region, provide protection from photodamages by absorption of high energy blue light and also by virtue of their anti-oxidant activity. Ocular phototoxicity is thus prevented by our efficient anti-oxidant system, in both young and old. One of the best commercial sources of pure lutein and zeaxanthin is Marigold flowers. Objective: In the present study, oil-soluble dietary carotenoid supplement constituting lutein and zeaxanthin in the ratio of 10:1 was evaluated for its modulatory effect on anti-oxidant enzymes and macular pigments in the serum and macula of the Swiss albino rats. Materials and Methods: Male Swiss albino rats were treated with carotenoid supplement constituting lutein and trans-Zeaxanthin (10:1) at two different doses daily, under standard experimental conditions for 42 days. End of the treatment, serum and macula were collected and used for measurement of lutein and zeaxanthin levels along with anti-oxidant parameters. Statistical Analysis Used: Statistical differences were assessed by analysis of variance (ANOVA) followed by Dunnet's test. P < 0.05 was considered statistically significant. All the results were expressed as mean ± standard deviation. Results: The supplement exhibited significant elevation of anti-oxidant enzyme levels in treated animals in dose-dependent manner. Concomitantly, the total anti-oxidant capacity has also been found to show similar increment at the end of the study period. This study revealed significant expression of the two macular pigments investigated. Conclusions: Our study, therefore, provides a strong claim for the anti-oxidant effect of the oil-soluble dietary carotenoid supplement, and thus substantiates its use in the prevention of phototoxic damage to the eye on long-term supplementation. Abbreviations used: AMD: Age related Macular Diseases; RPE: Retinal Pigment Epithelium; CAT: Catalase; SOD: Super Oxide Dismutase; TAC: Total Antioxidant Capacity; ROS: Reactive Oxygen Species; LC-MS: Liquid chromatography-mass spectrometry; p.o. : Per Orally; CMC Carboxymethyl cellulose.